One of the most classic passes in the Dolomites. There are a number of possibilities on how to reach the pass. Either one can come from a nearby pass on the Sella Ring – Jëuf de Frea/Grödner Joch/Passo Gardena (2122m) to the north or Passo Pordoi (2239m) to the south. Both these approaches are steep, but are relatively short climbs. I have set “difficulty” rating after the longer approaches. One of the most beautiful passes in the Dolomites. It was my first ever pass above 2000 m and thus has a special place in my memory. The roads are often quite good in this area and they resurface the roads around the Sella Ring every now and then as they are one of the main attractions for tourists in the Dolomites. Especially the road over the Passo Pordoi could be rather busy with cars, motorcycles and cyclists for sure. There is a bar on the top of all the passes in the Sella ring (Campolongo?) and plenty of accomodation in the villages in the valleys. 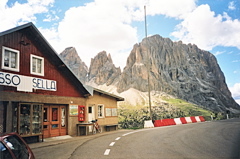 See also the old Passo Sella (2214m) which now also could be reached by a surfaced road (it is a different pass as it goes down another valley on the south side). Eur da Tieja/Tieja Sattel/Sella Tieja (2127m) on the map below may not be possible to climb with a road bike, but I do not know (it should be gravel and then steep with some concrete pavement at the end). Alpe di Suisi/Seiser Alm and the two passes I have noted there are nowadays possible to reach directly from Grödnertal via a very steep asphalt road over Bula/Pufels/Bulla. See Mont de Sëuc/Seiser Alm/Alpe di Siusi (1873m) for more information on this. The ladin badiot name for the pass is Ju de Sela.